Years adding up to #19 are represented by the Sun. Your energy this year will make people take notice. Bright and cheery they’ll want to bask in your light. Strong and determined, they’ll be impressed with your aura of authority. You’ll likely balk at any real or perceived boundaries, requiring complete control over your own destiny. In fact, during the Sun year, you might find it especially difficult to bend to another’s will, and your sunny disposition might quickly turn cloudy if you feel someone is trying to control you. During the Sun year you’ll willing to be vulnerable, but only if it means you’re free to be your true self. 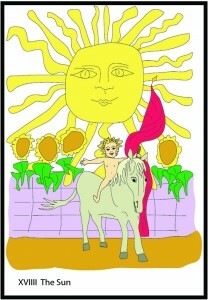 Decidedly artistic and imaginative, the Sun year shines brightest when you use it as an opportunity to create. The shadow symbols for the Sun are the Wheel of Fortune and the Magician.